You're not alone because many others think of it, and you're not alone because many others will help you avoid it. This is something I've meant to blog about for a while. I wasn't sure it would come across properly, but if this helps even one job seeker considering suicide, it's worth it. I regret not having done it sooner. Back in 2006, after my previous employer decided to outsource my entire team's work, I was living in Paris, France, and trying to find a job in Israel when I had the idea to start JobMob as a way to learn about blogging by blogging about that job search. I did ultimately find a job in Israel and we moved from Paris in 2007, but I kept blogging because I discovered that I really enjoyed helping other job seekers like you. There were also more selfish reasons. Among them, I thought that by learning more about job search as I blogged, I could protect myself from ever feeling job search depression again like I had back in 2002. Looking back at it now, my job search depression was relatively light compared to so many stories I've seen since then, but that rough period of life really surprised me and made me realize that your career is no joke and your life can literally depend on it. I never considered suicide. However, the tough time brought back memories of two cute little boys I used to babysit as a teenager. They lived in a nice neighborhood, in a nice house, and their parents had nice cars who would go out often and to good restaurants around town. All until their father was let go from his white collar job. This led to a noticeable change in the house, even in the eyes of a soon-to-be former babysitter. Then one busy morning during rush hour, the father walked in front of a subway train. My situation stinks and I have contemplated suicide. I often find myself alone and depressed with no optimism for my future. I feel like a wounded soldier in battle who has been left to die in the trenches, after broken promises. Unemployment over the period 2000 to 2011 was responsible for 45,000 [deaths], an analysis in the journal Lancet Psychiatry has found. The authors say their findings suggest that suicide prevention strategies need to target those who lose their jobs even in countries unaffected by recession. They found the suicide risk among the unemployed was stronger where more people were in work and the situation of the jobless was therefore more unusual. If you're feeling this down or know someone who is, please, PLEASE, follow this advice. Here's a list that should help. 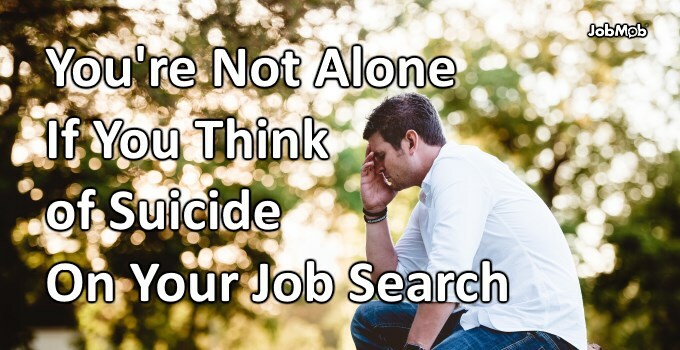 What would you have said to the JobMob reader thinking of suicide, in my place? Tell us in the comments. Subscribe to JobMob via email and follow me on Twitter for more lifesaving job search help. This article is pointless. You call the hotline, they attempt to hospital you, and then they sattle you with 3k in hospital bills for “saving your Life.” All while humiliating you. I’ve learned the hard way. If you want to die, you tell no one. You just one day disappear from everyone’s lives and hope they forgive you for your choice. That sounds horrible, adding insult to injury, and I’m sorry you had to go through it. It’s no help for you, but for countries with public health care such as Canada or the UK, it may be the same process and result except for the hospital bills at the end.